Lets face it nothing, says manly like having an epic looking beard only to be holding a dainty little stick of the best lip balm on the market and then rubbing it on your lips to keep them smooth. Just like when it comes to eating a banana, you should never look another man in the eye while applying a lip balm – it’s just one of those unwritten rules. I mean if that’s your thing, that’s cool too! However when picking up a lip balm or generically referred to as ChapStick (this is the brand name by Pfizer – much like how Kleenex is used interchangeably with tissues), its important to look out at the ingredient list so you aren’t wasting your money and are basically coating your lips with filler ingredients. You see some lip balms are loaded with filler ingredients that only act as a protectant and may actually dry out your lips – leading you to replenish more often. Darn those cleaver marketers out there! Therefore its extremely important to pick up a lip balm that has conditioning agents that are designed to keep your lips both well nourished and moisturized. 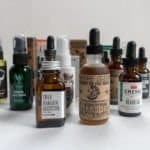 Popular balms have ingredients that very closely mimic the labels of some of the top beard balms and mustache waxes on the market today. They include ingredients like shea and cocoa butters that provide a ton of hydration. In addition to butters, you will also find beeswax which acts as a terrific skin protectant as well. Therefore when its applied your lips you will be naturally protecting harmful pollutants and environmental conditions from drying out your lips that may lead to eventual cracking and perhaps even worse – micro cracks that cause bleeding. By and far one of the most convenient for many will be the stick variety given their naturally compact size coupled with their mess-free application process. Plus its what many men are already familiar with. One downfall of sticks is their ability to immediately penetrate the surface of the skin on your lips like that of the squeeze lip balms. Those in need of immediate moisture relief should pick up a squeeze lip balm. To note: When it comes to squeeze lip balms, given their naturally softer composition, they will often lead to a shiny coat on your lips. Don’t worry, this will usually diminish after a few minutes. Sticks are more suited for their protectant abilities. Therefore if you are venturing out during the really cold and dry months of winter or desert conditions in the summer, a stick lip balm will be best – just be sure that you pick out one that includes beeswax. One of the main reasons why men purchase a lip balm is due to incredibly dry conditions. The cracking can become both unsightly and uncomfortable. However, given that the skin on your lips is incredibly thin, its important to also consider a lip balm that also contains some form of SPF protection. As you can see above, the ratings can vary wildly. From some offerings providing no protection, to those that deliver up to SPF 30, you should be able to easily find one to suit your needs. Now just a quick note: Given that lip balm is repeatedly applied throughout the day, you may not need to worry about maximum protection like you would with a traditional sunscreen. As you can see on the ingredient list for Burt’s Bees above, there is a rich mixture of beeswax, coconut oil, sunflower seed oil, and several other conditioning agents to just name a few. A key note about lanolin. 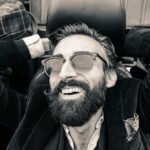 Lanolin is found in a plethora of skin care products, most notably we talked about it in our review of the best beard balms. What’s noteworthy about lanolin is that its naturally sourced from the wool of sheep. Much like we humans excrete sebum oil from our sebaceous glands, lanolin is essentially the sebum oil that has been collected from sheep when they shave the wool. 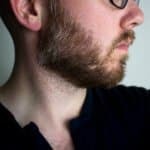 Some men may be put off by this notion of applying oil from an animal on their lips, however, its usually not a deal breaker for most but is at least worth mentioning. Other popular ingredients you will find in the popular lip balms will be candelilla wax (derived from a shrub), petroleum, and carrier oils (jojoba, sunflower, etc.). These all are key in delivery both protectant and nourishing abilities. This lip balm is packed with beneficial ingredients to help protect your lips from harmful UV rays as well as repair damage brought about by the elements. This balm contains both artificial and natural ingredients to deliver the most effective product for your lips. Some of the ingredients included are jojoba seed oil, castor seed oil, and sunflower seed oil to maximize health benefits. This balm uses a base of candelilla wax and carnauba wax which makes the balm rather hard. It does still spread on your lips, but it is not a soft lip balm. There are some exfoliating elements mixed into this wax to help relieve your lips of dead skin cells, but they should not be noticed when applying. As far as reception goes, Aesop products are usually a very trusted brand. This lip balm has everything you need to protect your lips, and it even goes so far as to include sunscreen to help fight off UVA/UVB rays. The few reviews say that this balm is actually rather hard, and doesn’t have the same creamy consistency as other balms do. It doesn’t melt in the sun, and it doesn’t leak in your pocket, which is good. However, spreading it on your lips may feel as though you aren’t getting any on at all. At $20, it’s an expensive lip balm to try, but if you’re already a fan of Aesop products, this could be worth your money. A lip balm should be reliable, and many stick balms are too hard or too soft, and leave unwanted residue on your lip. To combat this, Anthony has come up with a lip balm that spreads clear and easy, protecting your lips against harsh weather. Applying this product makes your lips shiny for a short while, but as the product soaks into your skin, it leaves behind a matte finish that’s perfect throughout the whole day. This lip balm contains natural and artificial ingredients, but they all contribute to overall skin health. The biggest players in this lip balm are shea butter and avocado oil, as they are both responsible for the softening of the lips and the area around them. Beeswax makes up the base of this balm, a tried and true ingredient that is known to help protect against harsh elements. Anthony lip balm also boasts SPF 15 protection from UVA and UVB rays. The lip balm has to be reapplied every hour or so to maintain adequate protection while you are in constant sunlight, but for cloudy days or every day use, applying twice a day or as often as needed should suffice. Overall, this product is great because it’s exceptionally effective at rejuvenating lips, and it’s more affordable than competing products. When it comes to your lip health, you should invest in a product that you know will work. This lip balm combines natural and commercial ingredients to get a moisturizing experience with less product. That being said, this lip balm is more liquid than competing products. It’s not a solid stick like popular Chapstick brand lip balm, and it doesn’t have the same consistency as a tin. Instead, it is more like a gloss, with a relatively liquid petroleum base. This does give your lips some shine to them, but it shouldn’t be too distracting. It contains numerous healthy ingredients such as jojoba extract, safflower oil, candelilla extract, and aloe vera extract for maximum lip health. This balm doesn’t feel oily on the skin, and is fragrance free for people with sensitive nasal passages. It moisturizes quickly and effectively, requiring less product per use, which in turn ensures that the product lasts longer. This product was not tested on animals, making it a cruelty free product that you can use with a clear conscience. The products used within are safe for use on all skin types, and should not cause adverse reaction on the skin. Of course, if irritation does occur, it is wise to discontinue use. Bigelow is a trusted cosmetic company, delivering quality products that look and feel good all throughout the day. Their method involves incorporating natural ingredients with tried and true methods of manufacture to create a perfect product every time. This product is sure to be your favorite lip balm! Dry, chapped lips are a year-round problem, often causing pain and discomfort due to harsh weather, sunburn, or even acidic drinks. 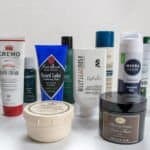 You want a lip balm that will protect you against these elements, and Baxter of California’s Hydro Salve is the way to go for long lasting lip care. This little tube of lip balm utilizes numerous natural ingredients to deliver the most effective lip care without being too harsh on the lips, such as coconut oil, shea butter, and jojoba oil. These ingredients, along with the addition of vitamin C, create an ideal softening agent that leaves your lips soft, silky, and smooth. This lip balm contains grape seed oil, jojoba seed oil, vitamins A, E, B5, and C, coconut oil, macadamia nut oil, shea butter, lime, peppermint, and lemon oils, as well as aloe vera for sunburn protection. 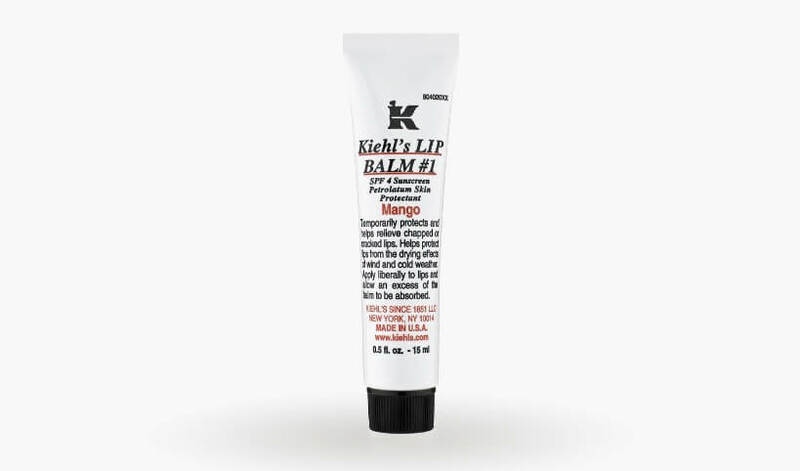 This concoction of ingredients is ideal for optimal lip health due to the vitamins and minerals present in the balm. It is carried by beeswax instead of petroleum, which is better for the body as well as for the environment. Some of the reviewers have stated that this balm is rather oily, and leaves a bit of a shine after application. While it doesn’t affect the performance of the product, it does look glossier than other brands. The other note buyers make is that sometimes it can cause a reaction around the lips and mouth area. This may be due to an allergic reaction to one or more ingredients present in the balm. There is no doubt about the popularity of Burt’s Bees lip balms. Found anywhere from the local gas station to the big box retailer, Burt’s Bees is likely one of the most accessible, yet effective lip balms that you can buy. While Burt’s Bees made a splash given that its 100% all natural and gets the job done tremendously well, it may not be the most intensive therapy balm out there for men, but its definitely something that should be a part of your everyday carry pack list. 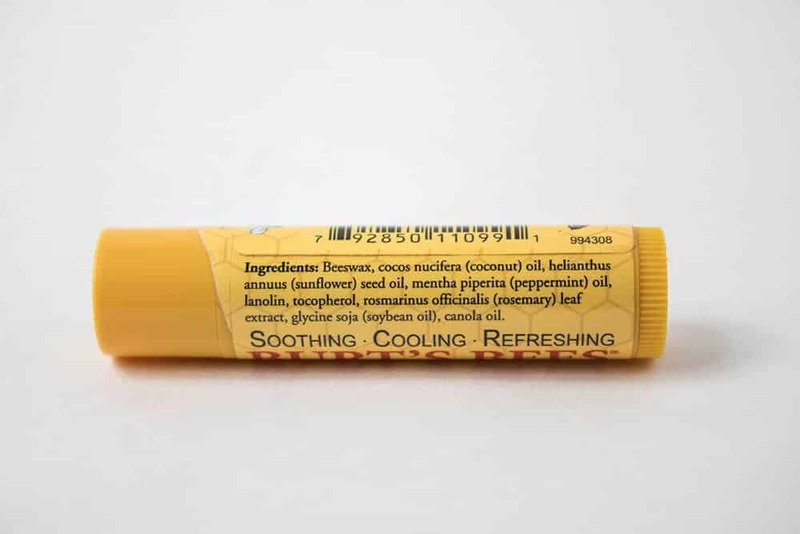 Burt’s Bees tends to work well in most environmental conditions, although if you are in extreme conditions of either a desert or the dry and frigid winter months you may be reaching regularly for this lip balm in order to maintain protection. The cool mint finish of the lip balm is sure to please and excite. C.O. Bigelow is one of those brands that just knows how to make a good skin care product. Their lip balm is one such example, offering up a moisturizing feel without being glossy. The cream finish of this lip balm is ideal for those with dry, chapped, and sensitive lips, who are looking for long lasting moisture throughout the day. This lip balm is infused with shea butter, a necessary ingredient that moisturizes and softens skin with regular use. It’s a great ingredient with numerous benefits, but for those men with extremely cracked and sensitive lips, shea butter is a fantastic repairing agent. Mint leaves a tingling sensation along the lips, which is seen by some buyers as refreshing. The mint isn’t too harsh, and smells amazing when applying. You shouldn’t expect this balm to burn, but rather, it will soothe as it protects your lips. It achieves the minty scent and taste with peppermint oil. Buyers highly recommend this product thanks to the fresh feeling they get when wearing it. 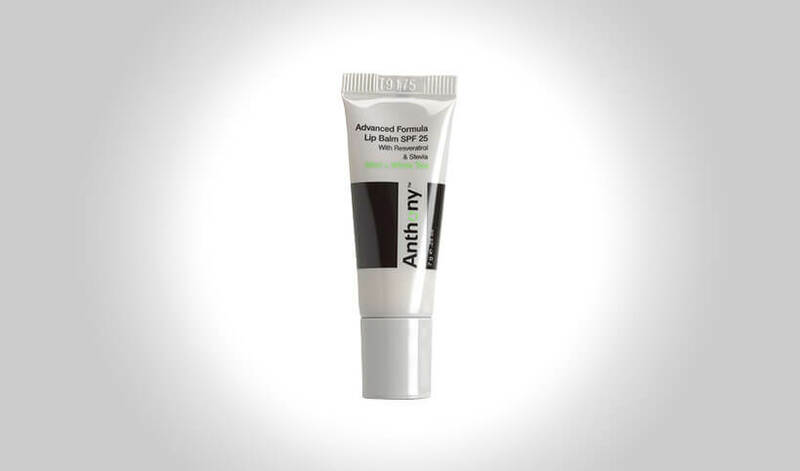 It reconditions, moisturizes, and protects your lips against harsh weather such as sun and wind. IN the winter, this lip balm is a hard-working addition to any daily routine. To use, apply liberally as many times as needed. Whether you are currently undergoing an acne treatment or have experienced harsh weather conditions, Dr. Dans CortiBalm is one of the highest peered reviewed lip balms. The reason why this lip balm is so highly thought of is given its ability to pretty much cure any sort of dry or cracked lips. Within the stick of this balm it contains just a few ingredients. First and foremost the active ingredient within this balm is hydrocortisone – which acts as an anti-inflammatory. Beyond hydrocortisone, this lip balm includes just a few – yet very important ingredients – beeswax, petroleum jelly, and lastly mineral oil. When all these ingredients are combined into one stick, you have an extremely effective lip balm that not only protects your lips with the use of beeswax, but also keeps them well moisturized. This lip balm is great for men who live in harsh conditions or are currently taking any medication for severe acne or psoriasis (i.e. Accutane, Amnesteen, and Soritane). A good sunblocking lip balm is essential for the summer. Sun damaged lips are not only extraordinarily painful, but excessive damage to the skin may result in skin diseases or cancer. This lip balm serves as a mild sun block, with an SPF of 15 for every-day use. It includes shea butter and aloe vera as a means to maintain moisture in the lips, contributing to their overall health and well-being. This lip balm also has the benefit of including vitamin E, a necessary ingredient for skin health in general. This lip balm is cruelty free, containing natural ingredients that serve to keep your lips soft and supple, while not coating them in gloss or shine like other lip balms do. It has a neutral scent and very little taste to keep you feeling masculine while wearing this lip balm. Overall, it won’t get in the way of your day to day activities like eating or drinking. Some reviewers do say that this lip balm is fairly cheap, both in price but also in how it feels. They compare it to a dollar store brand. However, it does work well, and doesn’t leave your lips excessively shiny. This is ideal for maintaining a masculine appearance while reaping the benefits of this men’s cosmetic product. Ideal for everyday use, and you are sure to get at least a month of wear out of the tube with a once-daily application. Evolution Man is one of the better companies for men’s care products. Their lip balm is packed with vitamins and antioxidants to help combat skin damage, and to rejuvenate your lips back to a healthy state. This lip balm is contained in an easy to use, post-recycled tube and the solid stick of product makes it exceptionally easy to apply. It goes on clean, gives just a touch of color, and is safe to use many times throughout the day. Simply apply as often as needed for that super healthy lip look. The ingredients are simple, made first with a base of beeswax. This base allows the product to be spread easily, as well as to protect against the elements. Shea butter and Sunflower oil are added for sun protection and also contribute to repairing and softening the lips. Finally, vitamin E is included as this particular supplement is necessary for healing the skin. SPF 15 is a very mild skin protection against the sun; while it is ideal for every day use, additional protection may be required for long hours out in the sun to fully protect your lips from blistering. Buyers say that the product works really well, even going so far as to say that it is an ideal alternative to other brands. It’s inexpensive and coats the entire lip without including harmful ingredients. Overall, it’s a fantastic product for use every day you are outside. Lip Balm is not your typical lip care product. Sure, it contains most of the same ingredients, but it is entirely vegan and all natural, ensuring that what you are putting on your skin is safe as well as effective. This lip balm uses natural ingredients to deliver a softness to your lips unlike anything you have experienced before, and, because it doesn’t contain harmful chemicals, you can be sure that it is healthy for your skin. However, some men might question the efficacy of the product. This product doesn’t use beeswax as a base, being all vegan ingredients. Instead, candelilla wax is used to create a soft but effective base with which to hold the other ingredients. Oils such as coconut, almond, citrus, and olive oil help to rejuvenate your lips and make them soft and supple again, and the addition of vanilla and chamomile extract help give this product a fantastic scent. It certainly doesn’t sound masculine, with the addition of flowers and fruits in your lip balm, but there is nothing more attractive than a man with nice looking lips. You will be blown away with how well this product works, and join the majority of reviewers that say this product is one of the best ones they’ve tried. All organic, completely vegan, and at a reasonable price, this is a go-to product for those individuals chasing soft, luxurious lips. 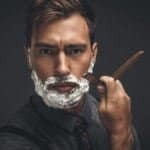 When paging through the latest men’s monthly magazine or browsing higher end sites across the web, there is no doubt that the name Jack Black (no not the actor) goes in tandem with quality grooming and general skin care products for men. 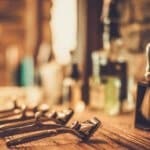 Whether its their latest shaving cream or facial moisturizer, Jack Black puts together an awesome lineup of products. When it comes to trying to find the best lip balms for men on the market today, Jack Black checks all the boxes. First and foremost their lip balm contains beeswax as the primary protectant along with shea butter as the primary moisturizer. Beyond beeswax and shea butter, Jack Black also includes avocado oil, green tea leaf extract, and cocoa seed butter. There is a reason why this lip balm commands the price tag that it does – its because its made of quality ingredients that set it apart from the rest. This lip balm also includes sun protection – in fact its rated at SPF 25! Whether you are battling the hot dry sun on a beach day in the dog days of summer or are living in the frigid dry north – there is likely no better lip balm that this one from Jack Black. For 165 years, Kiehl’s has been making high end products for both men and women alike. Their products sent the standard that many other brands are measured against, and their Lip Balm #1 is no exception. Made in the USA, this lip balm has effective hydrating properties that will make even the most rugged of lips considerably smoother and healthier. Packed with squalanea, lanolin, and wheat germ oil, your lips should be well moisturized rather quickly. In it’s compact .5oz packaging, it should be able to fit easily into your pocket or messenger bag. Much like Kiehl’s and Jack Black, L’Occitane is an extremely well known luxury cosmetics products maker that provides quality products. This moisturizing first lip balm leads with a shea butter that makes up 10% of the entire solution. Like many quality lotions, shea butter is terrific at providing moisture and nourishment to your skin without feeling too terribly oily like a petroleum based product. In addition to the shea butter, there are a few other oils that are contain within the tube that will further help to cure any severely chapped lips. Now if there was one caveat to this balm is that while it does contain beeswax, there might not be enough to provide an ample barrier to your skin. Therefore this balm is great for general climates that are too terribly severe. If you are looking for a completely all natural lip balm that isn’t Burt’s Bees, then this one is definitely worth your consideration. Based out of Indianapolis, this lip balm manufacturer prides itself in making an all natural lip balm that is non-toxic, non-gmo, and is gluten free. Beyond the terrific list of ingredients including quality carrier oils, beeswax, and even Vitamin E oil (which most manufacturers tend to skimp on due to costs), this balm will not only be effective at curing your dried out lips – but is also backed by a money back guarantee. Coming in all natural flavors, this lip balm should be safe not only for you, but all those in your family as well. 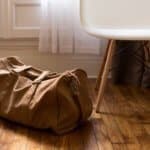 Oh and did we mention that the packing is earth friendly as well? This hydrating lip balm is great for all weather conditions as it hydrates and moisturizes without going on too glossy. Matte for Men believes in simple is better, and uses natural ingredients to deliver a hydrating lip balm without the gloss. Containing cocoa butter, beeswax, shea butter and vitamin E, this lip balm is a powerhouse of beneficial ingredients to get your lips back to normal. For men who work outside, this lip balm should be one of the first options. The beeswax used as a base is ideal for creating a shield around your lips, protecting them from harsh wind, sun, or even rain. Shea butter and cocoa butter has been proven to soften skin over time, and it will definitely do that to your lips as well. This is ideal for if you suffer from permanently chapped lips. Vitamin E is a necessary ingredient as it is used to promote skin health and regrowth, perfect for weather damaged lips. This balm does contain organic citrus oil, which is what gives it its scent, but it isn’t too overpowering. In fact it is noted to have a very mild smell and taste. It also does not leave a glossy shine. The only way you would have some gloss to your lips is if you over-apply the product. Otherwise, you have a completely matte finish and all day protection in your pocket. 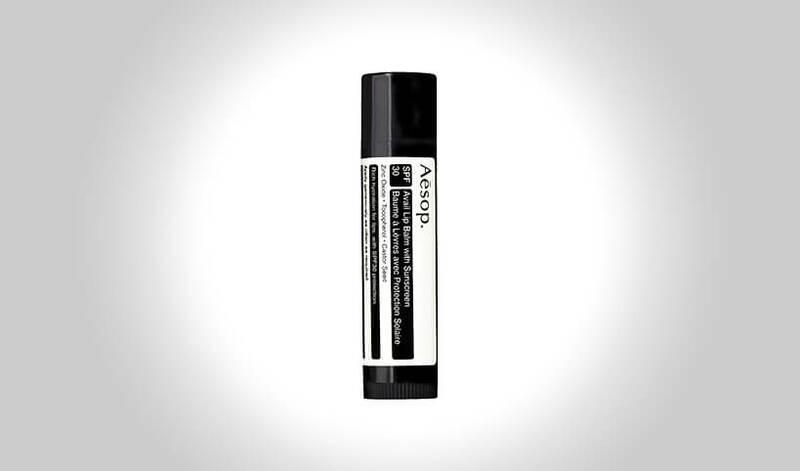 For men with chapped, broken lips, this moisturizing solid lip balm has you covered. MenScience uses natural ingredients to deliver superior results. This particular lip balm features SPF 30 protection, perfect for long hours in the sun. The protective capabilities of this product also save your lips against harsh wind and cold weather as well. The ingredients present in this product are designed to repair damaged lips over time and with frequent application. This product must be applied liberally to the lips to get the full effect of its protective capabilities. Because of this, it can feel very heavy on the lips throughout the day. It also may leave a bit of a shine because of how much is used. While a thin application of product may still protect your lips, you may have to reapply more frequently. This product is 0.3 ounces, which should last about a month of constant use. The price isn’t too bad either; it may be a little expensive if you go through more than a tube a month, but overall, for the quality of product that you get it isn’t too much to pay for something like this. Many reviewers like the way that this product work, saying that it is long lasting and you only need to apply twice daily if you use the recommended application method. It does give a great amount of protection, but buyers aren’t too crazy about the taste or the smell of this product. What many of the lip balms that we have reviewed so far have been lacking is any sort of protection from the sun. Therefore if you are living in the southwest USA or just generally in a dry or sunny desert climate – this lip balm is likely going to be the best one for you. In this lip balm Nutrogena includes sunscreen that is rated as SPF 15 and will be effective at blocking out harmful UVB rays. In fact, according to skincancer.org, SPF 15 should be effective in blocking out about 93% of the harmful rays. Beyond its sun blocking abilities, this lip balm contains a plethora of natural ingredients as well – most notably Nutrogena relies on Beeswax as a protectant for your lips followed up by castor seed oil as the primary moisturizing agent. Overall this is an incredibly effective lip balm that has dual use for when you are in a sunny environment. When it comes to Nivea products, we absolutely fell in love with their aftershave balm. 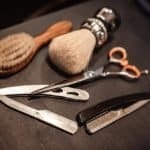 Using a plethora of natural ingredients that will turn even the most uncomfortable shave around, its definitely worth noting that Nivea knows a thing or two when it comes to grooming products. When considering their Kiss of Moisture lip balm, it is an incredibly well valued lip balm that should suffice for the majority of men out there – especially those who live in much more milder climates. While there are some synthetic ingredients that have snuck their way into this product, Nivea does rely on some all natural ingredients as well. A great general use lip balm that is extremely affordable. The masculine scent of dark Absinthe tangles with the subtle scent of licorice to create a unique experience for the nose and the lips. This balm serves to moisturize your lips, leaving them cool and smooth without the excessive burn you might get from alcohol. This is a petroleum based product, so you don’t need a lot to get the right amount of moisturizing. Of course, it does give your lips a bit of a shine to them, because the petroleum is a little oily as well. Your lips may feel slick and slippery, but overall, they should feel smooth and silky as well. This balm smells amazing, tastes great, and is completely unobtrusive during daily activities. Eating and drinking shouldn’t be a problem with this balm on your lips. The biggest issue that buyers have with this product is the tin is exceptionally hard to open when you first get it. Some buyers have had to employ knives or multi-tools to pry the lid off. This is a minor inconvenience, and once you get into the habit of taking the lid off, it should loosen up and make it easier to open. Overall, this is a very good product to use as it is very inexpensive. The balm smells nice, works well, and while it does leave a little shine on your lips, it protects them from the elements and keeps your lips looking healthier longer. Dry, cracked, or malnourished lips are bound to be a thing of the past after using this hydrating lip balm by Tom Ford. This little tube is packed full of vitamins, minerals, and moisture to keep your lips soft and supple, without making them look feminine or glossy. Using throughout the day as often as you need it delivers long lasting relief from the elements, such as the harsh summer sun or the cold winter chill. The carefully concocted formula protects, repairs, and ultimately revitalizes your lips back to flawless perfection. It is only 0.34 oz of product, but it is sure to last through several weeks, or even months of use depending on how often you apply the product. Tom Ford products are usually a bit more expensive than competing products, but the price is more than often well worth it. This product has raving reviews about the quality and the lasting effects of the balm itself. If you’re in the market for a great lip balm. When looking for intensive care for your lips primarily for overnight use, Vaseline is often sought for as a cure for severely chapped lips. Unlike many of the other popular lip balms, this tube only contains two ingredients – white petroleum and flavor. What’s noticeably absent from this balm is the use of moisturizing agents like a butter or carrier oil and also any sort of protectants like beeswax. According to the Vaseline site, petroleum jelly is essentially a hybrid between both mineral oils and natural waxes – therefore this ingredient has dual uses. While some may be on the fence about the flavor of this jelly, there is no doubting its effectiveness – theres a reason why men and women have been using this stuff for more than 150 years!